Meet Sabrina Barone, Assistant Curriculum Leader at York Memorial Collegiate Institute. Sabrina has been a TFSS Ambassador well before TFSS had an Ambassador team! Starting in 2010, Sabrina spearheaded the largest social justice club at York Memorial CI called “Give Charity”. Give Charity gives students the opportunity to make a difference both globally and locally. And, boy, do they help! Sabrina found TFSS because of her passion to help support students. The next thing she knew she was in the subway, shaking donation jars and singing alongside her students to raise public awareness and funds for Student Nutrition Programs through the TTC Take Over. Sabrina knows, all too well, if she’s teaching a hungry student it’s hard for them to focus and if they can’t focus it’s hard to learn. Sabrina jumped at the opportunity to help support hungry TDSB students, but she didn’t stop there. Through Sabrina`s leadership, her students have volunteered and participated in every TFSS event and campaign. 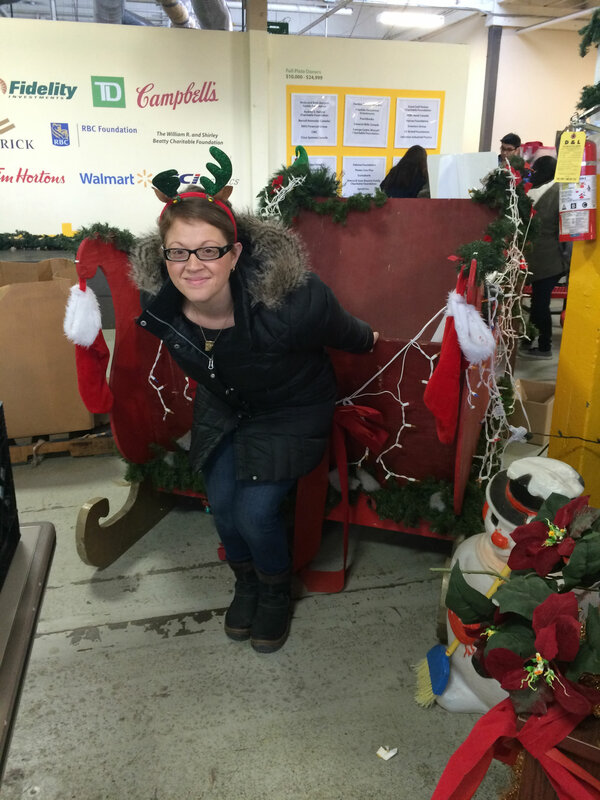 From rallying cheering committees, to selling festive red noses, to creating her own in-school fundraisers- Sabrina has never missed an opportunity to support her charity, TFSS. And TFSS couldn’t be more thankful for dedicated and passionate educators like Sabrina! Knowing that far too many students were coming to class with hungry stomachs, Child and Youth Worker at George Harvey Collegiate Institute, Vince McCormack, decided to do something to help. With just one other colleague and four students, McCormack piloted the school’s first Student Nutrition Program. 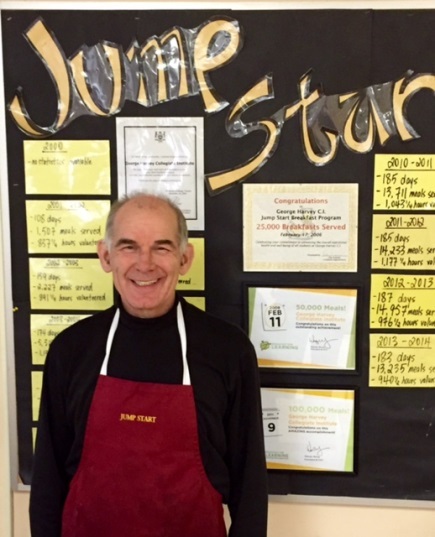 15 years later, and 150,000 meals served, you can still find Vince in the school kitchen before 8 a.m. every day, with a spatula in his hand, an apron tied around his waist and a number of student sous chefs. Through the Student Nutrition Program, Vince empowers his students to take initiative and leadership. He appoints students to help complete budget reports and nominates students to oversee and organize their involvement in the feed tomorrow fundraising event, the TTC Take Over, which he’s participated in every year since it started. From joining his students and helping raise funds through the TTC Take Over, to helping to sell red noses in the Red Nose Campaign, to cheering for the Marlies at the TDSB/TFSS Day at the Marlies, Vince is an outstanding TFSS Ambassador! In the social media sea of ALS Bucket Challenge Videos, TFSS` Communications Officer stumbled across one very special and unique rendition of the video challenge. TDSB’s Jason To, Curriculum Leader at Westview Centennial Secondary School, posted his own version of the Bucket Challenge. Rather than talk about and donate to ALS in his challenge, Jason decided to keep his donation “in the family” by supporting TFSS. Without even knowing it, and certainly without the recognition, Jason was one of our most outspoken Ambassadors! When asked what inspired him to make the video and support TFSS his response was simple – his schools snack program is funded by TFSS. He sees the impact that TFSS has on students, every day! Jacqueline Smith is a very passionate and dedicated Child and Youth Councillor (CYC) at Central Toronto Academy, formally Central Commerce Collegiate Institute. On top of her duties as a CYC, she has taken on organizing the school`s multi-cultural club. The club promotes student leadership, planning, advocacy and teamwork skills. It’s a student-led, student-focused club, where members meet on a weekly basis to plan and implement school-wide socio-cultural, educational and entertaining activities. Under Jacqueline’s leadership, the club organizes events throughout the year. Last year, Jacqueline invited Stacey McKenzie, a Canadian fashion model and most recently a model coach and judge on Canada’s Next Top Model to present her ‘Walk this Way Workshop’, a self-esteem building presentation. But Jacqueline doesn’t stop there! She and the multi-cultural club also initiate multiple fundraisers. From bake sales, to selling red noses during the TFSS Red Nose Campaign, Jacqueline has a huge impact on her students, and the community.